Threat for light freezing rain early Friday morning. Travel may be difficult in east AR before 9am. Light rain will arrive from the south early Friday, mainly after 3am. Temperatures as light rain arrives will be near or slightly below freezing across east AR and could flirt with the freezing mark in far north MS and west TN. Freezing rain could result as liquid precipitation freezes on contact with exposed surfaces. THE NATIONAL WEATHER SERVICE IN MEMPHIS HAS ISSUED A WINTER WEATHER ADVISORY FOR FREEZING RAIN...WHICH IS IN EFFECT FROM MIDNIGHT TONIGHT TO 9 AM CST FRIDAY. * SNOW/SLEET/ICE ACCUMULATIONS...LIGHT ACCUMULATIONS OF FREEZING RAIN...LESS THAN A TENTH OF AN INCH. * TIMING...FREEZING RAIN IS FORECAST FROM MIDNIGHT THROUGH 9 AM FRIDAY MORNING. * IMPACTS...ROADWAYS ARE THE PRIMARY IMPACT. BE PREPARED FOR SLIPPERY ROADS AND HAZARDOUS IN FREEZING RAIN. 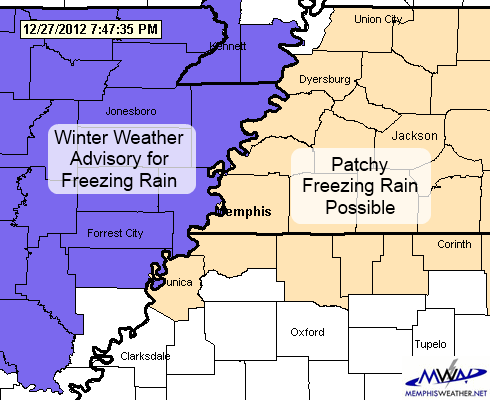 A WINTER WEATHER ADVISORY MEANS THAT PERIODS OF FREEZING RAIN WILL CAUSE TRAVEL DIFFICULTIES. BE PREPARED FOR SLIPPERY ROADS AND LIMITED VISIBILITIES...AND USE CAUTION WHILE DRIVING. In west TN and far north MS, temperatures is rural areas could dip to the freezing mark, creating hazardous driving conditions, mainly on bridges and overpasses. Conditions will improve by 9am as temperatures rise above freezing. The low temperature in Memphis proper should be just above freezing and no signficant issues are expected in the city. THERE IS THE POSSIBILITY OF PATCHY FREEZING RAIN FROM LATE TONIGHT INTO FRIDAY MORNING ACROSS WEST TENNESSEE AND EXTREME NORTH MISSISSIPPI. THIS IS AN AREA ROUGHLY NORTH OF A LINE OF TUNICA TO IUKA. ANY FREEZING RAIN OR SLEET THAT FALLS IS FORECAST TO TURN TO ALL RAIN BY MID-MORNING SOUTH OF A LINE FROM RIPLEY TO HUNTINGDON...NORTH OF THIS AREA IT MAY CONTINUE BEYOND THIS TIME. MOTORISTS WHO ARE TRAVELING ACROSS THIS AREA ARE ADVISED TO MONITOR THE LATEST FORECAST AND BE AWARE OF TEMPERATURES WHICH WILL BE NEAR FREEZING. BRIDGES AND OVERPASSES ARE THE MOST VULNERABLE TO ICY CONDITIONS. If you plan to be on the roads early Saturday morning, please be extremely cautious as roads could be slippery. GOES-East satellite capturing snow, contrails, and more! Yesterday we saw snow cover over Arkansas and eastern Texas and Oklahoma on satellite imagery. This morning, more cool-ness from 22,500 miles up! A visible shot from GOES-East shows snow cover in northeast AR that is not obscured by clouds (the brighter white area), contrails from jet airplanes at cruise altitude, thin cirrus overhead the snow/contrails as high level moisture streams over the area, and even marine cumulus clouds created by 35-40 degree air blowing over much warmer water in the Gulf! Click the image for a full-size version with more detail. Snow officially began at Memphis International Airport at 11:53pm Christmas night, thus officially Memphis recorded a trace of snow on Christmas Day. While this doesn't technically count as a "White Christmas" (which occurs when an inch of snow occurs on Christmas Day), we'll take what we got! Snow continued overnight, then flurries and a few light snow "squalls" passed through until the mid-morning hours this morning. UPDATE: Memphis International received 0.9" of snow - the "official" Memphis total. Cirrus Weather Solutions/MemphisWeather.net (MWN) in north Bartlett picked up 1.3". As predicted the heaviest snow totals of 8-12" and highest wind gusts occurred over northeast AR (and points northeast from there). 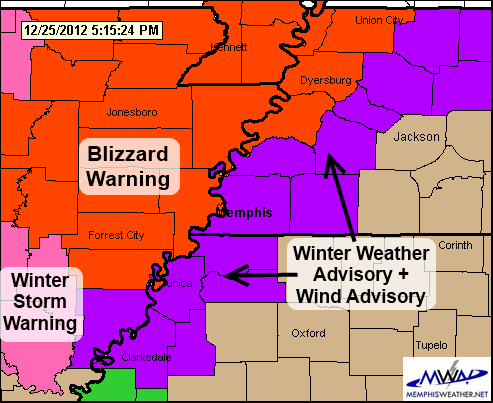 Thus, not only was a Blizzard Warning issued for the first time in recent memory (and perhaps ever) in the Mid-South, but it verified. Final snow totals in the metro ended up near 1" for west Tennessee portions of the metro, with slightly lower amounts over north MS. A preliminary graphic of snow totals is shown below. So how well did reality compare to our predictions? Actually not too bad! Though our projections increased slightly as the event drew closer, we still called for 1-4" yesterday afternoon. 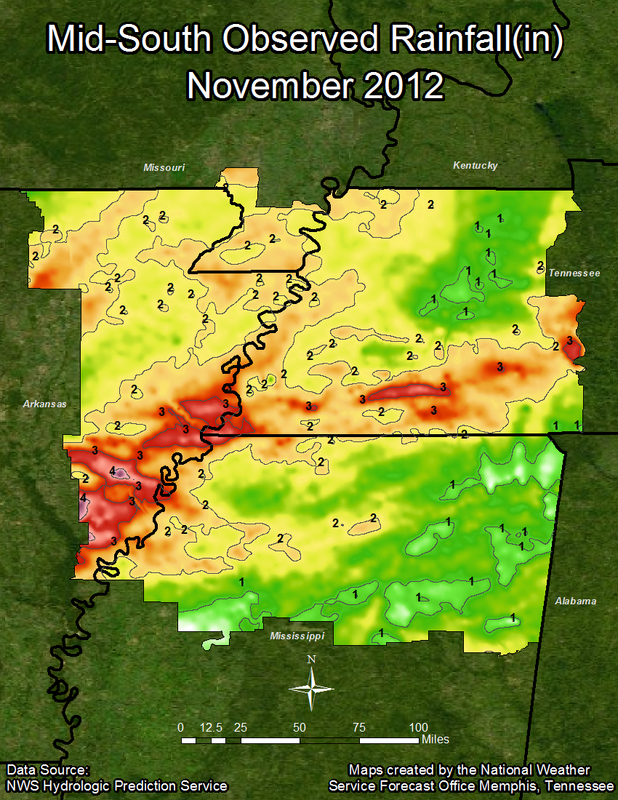 3" readings were found just north and west of Crittenden County. 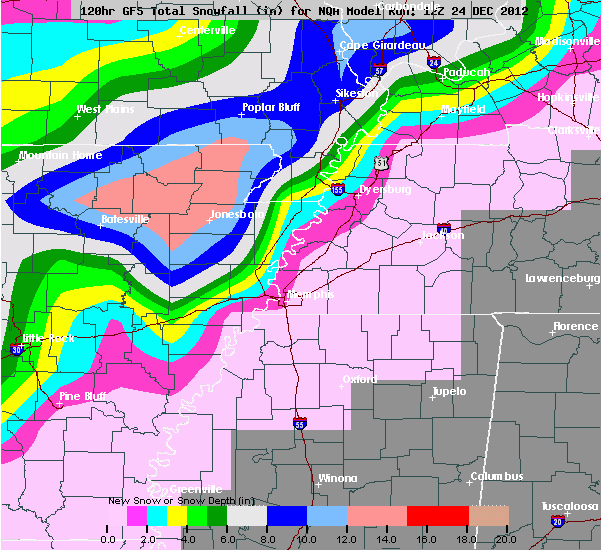 In fact, our first mention of forecast snow amounts (on Sunday) was for "about an inch in Shelby County." Looking back on the computer model data, the snowfall map that most closely resembled actual was the one below, the GFS from Sunday morning (which was the one we used for our Sunday forecast). Notice how similar it is to the map above. Later models actually overdid the expected totals, which is why our snow forecast range increased to 1-4" by Tuesday afternoon. We also have to give kudos to the National Weather Service in Memphis for an outstanding job leading up to the event! Blizzard Warnings, Winter Weather Advisories, and Wind Advisories were all appropriate and timely and their forecasts were also exceptional. Their guidance was very useful to us "private meteorologists." Looking back at the Sunday morning GFS computer model forecast of expected snow amounts. This forecast verified well with reality. For an interesting perspective, consider the picture below - a satellite image taken from 22,500 miles up at 10:30 this morning. 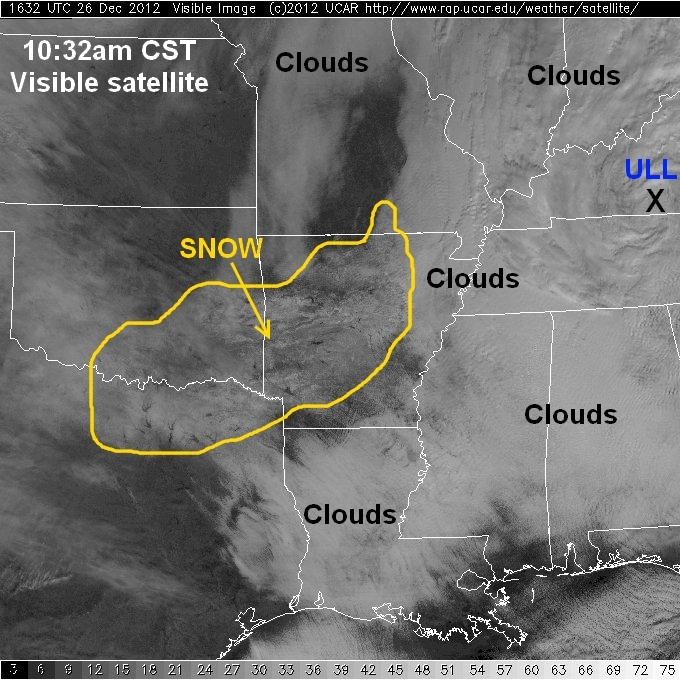 Though clouds blanketed much of the local area, snow cover is visible from teh Red River Valley in TX and OK across much of the state of AR. Once clouds move out, we'll also see that this snow extends northeast just north of the Ohio River into southern IL, IN and OH, where it's still snowing thanks to the upper level low moving east just north of Nashville. Many thanks to all of you who followed MemphisWeather.net or used our products or services before and during the event. Also, WELCOME to all of our new followers and visitors! I am also eternally grateful to MWN intern Patrick and former intern Kevin (who reunited with us for this event) for assisting in providing continuous coverage throughout the day and into the early hours this morning on our social media channels, allowing me to spend some time with my family on Christmas Day. Our Facebook and Twitter feeds (linked below) are where you can find the latest information on local weather patterns, as well as nowcasting (or snowcasting) during inclement conditions. In addition, the MWN app allows you to keep up with the latest conditions, our forecasts, radar, and more, no matter where you are. Plus, if you like to see SNOW on your radar display, and not have to guess what is rain vs. snow, you need to download the MWN app with StormView Radar (see below)! 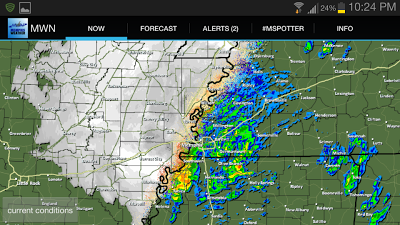 Screenshot of full-screen MWN StormView Radar on Android taken during the winter weather event. Christmas night winter weather update - SNOW! An updated warning map is shown below. The National Weather Service has extended the Blizzard Warning south into Crittenden, Lee, and St. Francis counties in AR this afternoon, indicating that heavy snow and high wind will bring greatly reduced visibility in blowing snow overnight. The warning is in effect from 9pm to 9am. Snow totals in the Blizzard Warning area will be in the 3-10" range with highest totals in the Jonesboro to Kennett area. Wind gusts could reach 35-45 mph overnight. Most of the metro, particularly east of the Mississippi River, is under a Winter Weather Advisory and Wind Advisory with snowfall totals of 1-4" expected and wind gusts of 30-40 mph. Changeover from rain to snow is expected around midnight just west of the river to about 2am in the eastern metro. Lower snowfall totals are expected in Marshall County, with higher amounts near the river. Apparently enough of you dreamed of a White Christmas last night to shift the incoming weather system slightly south and it looks like many of us will wake up Wednesday morning to SNOW! Briefly (as it is Christmas morning as I type this), the southward trend in the computer models beginning yesterday afternoon has resulted in a concurrence of the data and high enough confidence to result in the issuance of a Winter Weather Advisory for all of the metro except Marshall County, as well as a Wind Advisory for the entire Mid-South. 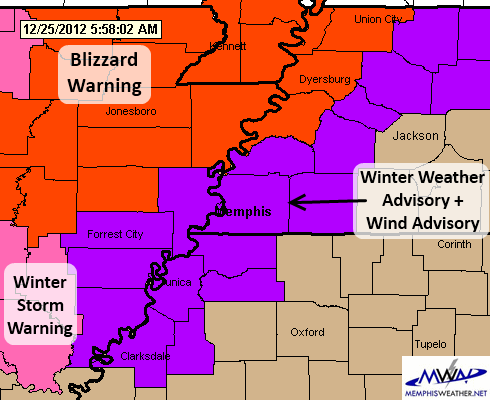 Areas just northwest of the metro, including much of northeast AR and far northwest TN are now under a Blizzard Warning. In the metro, look for rain to arrive later this morning and last throughout Christmas Day. In addition, wind will pick up and become gusty by this evening. There is a chance of some rumbles of thunder this evening, mainly to our southeast over northeast and central MS. Around midnight, low pressure will pass by just to our east and very cold air will spill in on northwest wind beginning a rapid changeover of rain to snow. During the transition, some sleet is also possible, but accumulations would be minor. Snow is expected to fall from the wee hours Wednesday morning until around dawn and then flurries could last into the mid-morning hours Wednesday. Snowfall totals in the Winter Weather Advisory (including the metro) will generally range from 1-3", though there is the possibility of higher amounts over Tipton, far northwest Shelby, and northern Crittenden Counties. To the south, an inch is possible in northern Marshall County. Wind gusts to 30-40 mph overnight could lead to blowing snow and reduced visibilities. Take this into account if you have to head to work early Wednesday morning. We'll have more later today on our social channels and probably this blog. Any travel plans to northern AR, far northwest TN, or points north need to be reconsidered in light of significant winter weather. In addition, severe storms will occur to our south, including the likelihood of tornadoes in Louisiana, central and southern MS, and AL, today into tonight. 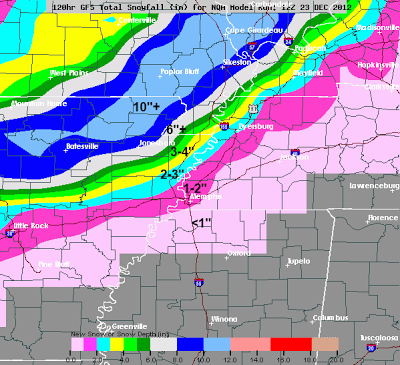 We've posted daily blogs since last Friday on the chance of winter weather in the Mid-South. Today's post provides the latest information based on the morning computer model runs. Christmas Day will be wet - very wet - especially after Christmas lunch. Rain moves in by noon or so with temps in the mid 40s and a gusty northeast wind. As low pressure moves into north MS in the evening, a warm front will approach the TN-MS border, which could put southeast portions of the metro (over north MS) in the warm sector of the system. Strong storms are possible in this warm sector so some lightning and thunder will be possible for DeSoto, Marshall, Tate, and Tunica Counties, while the rest of the metro could see heavy rain. Once the low moves to our east, by late evening, wind will switch to the northwest and the arrival of cold air begins. As temperatures drop, especially across east AR, rain will change to snow overnight. Computer models indicate that there will be a tight gradient between the "haves" and "have-nots" as far as snow is concerned. In fact, the morning GFS model snow output (below) indicates that the Mississippi River will approximate the dividing line. Light amounts of snow (generally less than 2" and probably less than 1") will be found east of the river, while amounts of 6"+ could be found as close by as far northwest Crittenden Co.
6am GFS model output showing projected snow totals. A foot or more is possible around Jonesboro, while Memphis may see as little as an inch. Not shown, the morning NAM model also placed heavy snow over the Little Rock to Jonesboro corridor, but had substantially less (1-2") for areas between Jonesboro and Memphis. The ECMWF (Euro) model from last night was "middle of the road" with heavy snow over the same areas as the GFS and 1-2" in the Memphis metro. So, specifically for Memphis and points east and south within the metro, the changeover will likely occur well after midnight, which would likely result in an inch, or perhaps less, of snow accumulation by dawn and flurries throughout the morning on Wednesday. Roads will be passable and likely just wet as air temperatures should stay just above freezing Tuesday night and Wednesday morning east of the river and for most of the metro. Temperatures on Wednesday will remain in the 30s with a gusty north wind, making it feel like the 20s all day. Across the river in AR, anything is possible, including enough snow to create hazardous driving conditions Tuesday night into Wednesday. If you have travel plans into OK, AR (especially north of I-40), southeast MO, western KY and southern IL and IN, please consider the forecast conditions. All of these areas could experience enough snow and wind to make travel treacherous. Also note that areas from east TX through Louisiana, central and southern MS, and Alabama east into the Atlanta area are expecting a severe weather outbreak Christmas Day into early Wednesday morning. Tornadoes, some of which could be strong and long-tracked, large hail, and damaging straight line wind are all possible. Storms will start in Louisiana and east TX tonight and move into MS by afternoon/evening and AL after dark Christmas night. If you are traveling south, or have friends and family in these areas, PLEASE alert them to keep a close eye on the weather and monitor local authorities for the latest information. 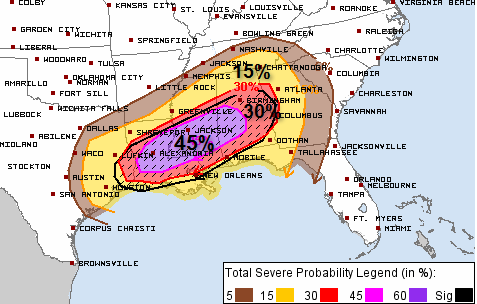 Severe weather probabilities for Christmas Day/night. A severe weather outbreak is forecast for the Deep South. Follow MemphisWeather.net on Facebook, Twitter, or Google+ (links below) for the latest information on potential winter weather. In addition, the MemphisWeather.net app will give you everything you need while away from your computer. StormView Radar shows where it's raining and where it's snowing, weather alerts from MWN StormWatch+ will advise you of any changes to watches, warnings, or advisories, and the MWN Forecast will tell you exactly what we expect to happen, from a local perspective (national apps tend to not do well in these dynamic events - you need a local source). A low pressure system will move out of the Texas Christmas morning and turn northeast as it strengthens. By 9pm Christmas night, it will be positioned over northern Mississippi. In the meantime, a very potent upper level disturbance will move across northern AR. All along we've talked about the need for moisture (preferably the falling kind) and cold air at the same time. The upper-level disturbance will act to rapidly cool the atmosphere as it moves toward the region. The northwest side of the low is also where the best moisture is relative to that cold air. Thus it appears areas north and west of Memphis (or roughly north of I-40 across AR into the northern half of west TN) will be in perfect position to see the highest snowfall totals. With the low moving so close to Memphis, it will take longer for the "sufficiently cold" air to arrive, thus delaying the onset of the rain/snow changeover enough that much of the best moisture will be moving away. The graphic below shows the position of the low at 9pm Christmas night, where the precipitation is expected to be falling, and where the rain-snow line should be (approximately). Based on consistency of the model and the fact that it initialized well, this model (the 12Z GFS) is our model of choice for now. Low pressure moving northeast through northeast MS. Rain/snow line marked in solid blue. The rain/snow line will shift east overnight but the precipitation areas will move northeast, leaving minor amounts of precipitation left after the rain/snow line passes through the Memphis metro. Rain will begin by noon Christmas Day with temperatures in the mid 40s. The heaviest precipitation will fall as rain before temperatures start to fall into the upper 30s by late afternoon or early evening. Precipitation will begin to changeover to snow by late evening (8-10pm) across the northwestern metro (north Crittenden Co into western Tipton Co) then gradually mix with and change to light snow in the rest of the metro, including Memphis and Shelby Co, around midnight. Snowfall totals will range from a dusting on grassy areas over north MS to about an inch in Shelby County to 2-3" in areas that change over to snow the earliest (north Crittenden and Tipton Co). By Wednesday morning, flurries may linger but accumulating snow will be over. Temperatures will remain in the 30s Wednesday with a cold north wind and plenty of cloud cover. Places that get more than an inch of snow could see it stick around into Thursday. If you plan to drive Tuesday evening or early Wednesday in northern AR (anywhere north of I-40), northwest TN (west of US 51), southern MO, western KY, or southern IL, please keep a close eye on forecasts and prepare a "plan B" now - either traveling earlier or delaying a day. In addition to snow, very gusty wind will meaning blowing snow and reduced visibility in these areas, making travel difficult to treacherous, especially Tuesday evening. As always, this post is disclaimed by the fact that we are still 48+ hours from the snow beginning and lots of things can, and maybe will, change. It does not appear that this will be a significant snow for the metro, but a little bit is better than nothing! Follow us on Facebook, Twitter, or Google+ (links below) for the latest on this developing winter weather scenario and we plan to update this blog again on Monday afternoon with the most recent information. Finally, the MemphisWeather.net app will give you everything you need while away from your computer. StormView Radar shows where it's raining and where it's snowing, weather alerts from MWN StormWatch+ will advise you of any changes to watches, warnings, or advisories, and the MWN Forecast will tell you exactly what we expect to happen, from a local perspective (national apps tend to not do well in these dynamic events - you need a local source). Nowcasting services available on our Facebook page and Twitter feed. We're also on Google+! * WINDS...SUSTAINED WINDS AROUND 25 MPH WITH GUSTS AROUND 35 MPH. VISIBILITIES. TRAVEL WILL LIKELY BECOME HAZARDOUS. Snow is really cool in the Mid-South, especially since we don't see it much (it's been over 380 days since we last got "measurable snowfall.") It's even more fun when it falls on Christmas Day, as a White Christmas is even more rare. Yesterday we began discussing a Christmas Day storm system that has the potential to bring a layer of white to the Memphis metro. This post is just a quick update to that one. 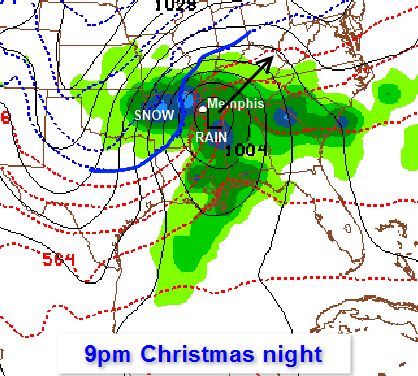 To sum it up, computer models still indicate a strong possibility of rain on Christmas afternoon changing to snow on Christmas night here in the metro and points north. Low pressure (which is currently off the coast of the Pacific Northwest) will move through the Rockies and head across the Southern Plains before turning northeast, tapping into Gulf moisture, and passing just to our south. With plenty of moisture to work with and cold air moving in behind the low, we have the classic setup for snow in the Mid-South. As mentioned yesterday, the arrival of sufficient cold air and remaining moisture have to coincide. According to the most recent mid-range model data, which is remaining fairly consistent on the big picture, the changeover to snow would occur sometime after 6pm and before midnight Christmas night with precipitation tapering off after midnight (on Wednesday). So while the window of opportunity is somewhat narrow, it's definitely there. Below is this morning's computer model data from the GFS model. 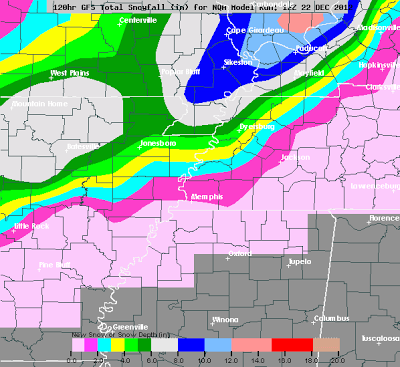 The morning European model is similar, with slightly higher amounts on the AR side of the Mississippi River. Total snowfall amounts from both models are somewhere in the 1-4" range. The 12Z (morning) model run of the GFS shows anywhere from 1-4" of snow on Christmas night in the metro. This is NOT a forecast, but one possibility from one run of a computer model. Remember that guidance from the models can and will change many times between now and Tuesday. However, there is sufficient confidence in the overall pattern to include the possibility of accumulating snow in the forecast. If you have travel plans Christmas night or Wednesday, especially north of the metro, keep a close eye on the forecast and remain flexible. We'll continue to monitor and keep you updated! "I'm dreaming of a White Christmas... "
Wind subsides, so let's talk about Christmas weather! As promised, the Thursday weather system brought a great deal of wind to the area, including some sporadic damage, but the storms themselves were generally more bark than bite and passed through the metro quickly in the 4am hour Thursday. The cold air behind the departing system set us up for a chilly day for the first day of winter, which started at 5:12am CST today. Moderating temperatures are expected this weekend as wind switches to the south on Saturday. The next precipitation-inducing impulse will move through Sunday night and early Monday. Scattered light showers are likely as early as Sunday afternoon as moisture increases ahead of the system, but temps will still rise to near 60 on Sunday. A few weak thundershowers are possible Sunday night into early Monday as the impulse moves through, then most of Christmas Eve should be dry and seasonal with highs in the upper half of the 50s. What has been getting many people's attention is the next big system to affect the eastern U.S. and how it will affect holiday plans and travel. We've reserved comment to this point as we dealt with yesterday's front & post-frontal wind and while the computer models tried to better resolve the overall pattern. 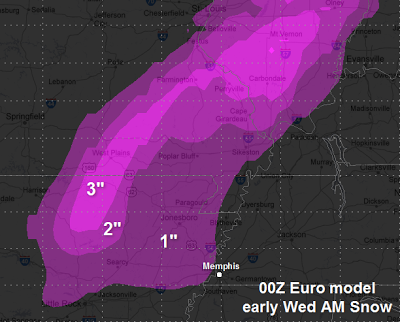 The mid-range models of choice at MemphisWeather.net - the GFS and Euro (or ECMWF) - are finally coming into agreement on the big picture, but those pesky details (that make all the difference) are still being worked out. What we do know is that a low pressure system moving out of the Southern Plains will pass by to our south on Christmas night before heading up the East Coast. In the winter, that means we'll be on the cold side of the low, which is a good setup for something other than liquid precipitation. Two main ingredients are required for winter precip: 1) sufficient cold air and 2) available moisture, especially in the lower levels. When they are both in place, snow or other wintry precip can occur. Lacking one, we get nothing (or rain). The latest Euro model, as well as the last couple of model runs of the GFS, are in enough agreement that we can now safely say that there is POTENTIAL for some light snow late Tuesday night into Wednesday morning (the 26th) in the metro area. I've placed a couple of graphics below to demonstrate. Last night's European model shows some snowfall potential mainly northwest of Memphis, however light snow would be likely in the scenario in the immediate area with an inch or more just across the river. Friday morning GFS model output. Graphic is read RIGHT to LEFT. Green bars are rain. Blue or gray bars are snow. The red line is surface temperature. The amounts of precip are SMALL from this model run, with a total of under 0.20" of snow, but like the Euro, it shows the potential for some flakes. The scale for temp & precip amounts is on the right. Click image to see much larger view. Understand that this is about potential and neither of these graphics are an official forecast. The MWN forecast itself calls for a chance of rain or light snow and will have to be refined as time draws near. We do not hype for hype's sake, but when there is a decent chance of an event occurring, we let you know. Bottom line: I would not be surprised by an inch of snow on grassy surfaces Wednesday morning. I also would not be a bit surprised to see nothing. I don't expect a lot of travel issues with this system locally, though there is some potential for problems from OK into northern AR, southern MO on Christmas night and southern IL and IN on the 26th. We'll keep you updated! If you've been following along with us the past couple of days, you know that there is a high likelihood of t'storms tonight and that a few of them could be severe. This serves as the last blog update on what to expect tonight into Thursday. All other updates will be handled on our social media feeds, listed below. Yesterday we highlighted the potential risks and timing of the storms. Much of that information is still valid so I refer you to it for the atmospheric details. In this post, we re-iterate and refine the answer to the question "what's going to happen and when?" Below is the map produced by the Storm Prediction Center highlighting in yellow the areas they think are at the greatest risk of severe storms. Memphis is in the Slight Risk zone. 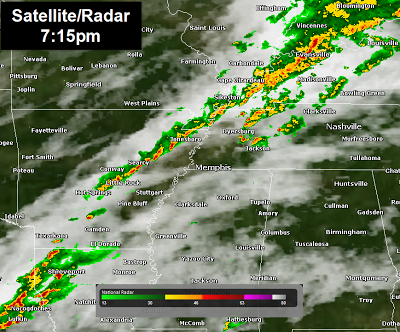 Storms will begin to break out in western AR this evening, then form into a squall line as they move rapidly east. Refining the slight risk area, we expect the greater danger of severe weather to be in the western half of the risk zone, with lessening threats in eastern AR, west TN, and north MS. The primary threat locally will be strong to damaging wind gusts of up to 50-60 mph in the squall line and immediately behind it. The line of storms is expected to be pushing into the metro after 4am and will likely be clear of the Memphis area by 7am at the latest. A few showers are possible ahead of the line, mainly after midnight, and thunderstorms are possible after about 3am, though we do not expect a lot of thunder and lightning before the line arrives. The area of greatest concern is in the western half of the Slight Risk area tonight, though damaging wind is possible anywhere in the yellow area. Outside of the line, wind will generally be strong with south wind gusting to 30-35 mph overnight and as high as 40-50 mph from the west during the morning hours behind the front. Any rain behind the front will linger only a couple of hours and sunshine is expected by mid-morning. The sun won't help temperatures though, as they will fall from the lower 50s when the line moves through to the lower to mid 40s by afternoon. Combined with a gusty wind, wind chills will fall below freezing - a far cry from the upper 60s this afternoon! The cold front will be just east of Memphis at 6am. Strong gusting wind will be an issue both ahead of and behind the front and any storms will be just ahead of and along the front. As always, stay with MemphisWeather.net on the web, mobile web, and social media for the latest info concerning the potential severe weather. Our mobile apps featuring StormWatch+ will alert you (if you want them to) to any watches or warnings that are issued for your location and can even wake you up at night for any severe storms that you are in the path of. You can find all our links below. The unusually warm temperatures so far this month have meant a couple of chances of severe weather and it appears we have another one in store. A potent winter low pressure system will move out of the Rockies and into the southern Plains on Wednesday, then heads towards Chicago by Thursday morning. A forecast of blizzard conditions across the central Plains into the Midwest portends a strong system and with the Mid-South in the warm sector of the system, we can expect equally impact-ful weather, only not of the white variety! The low pressure system responsible for the significant storm will be over northern OK early Wednesday evening. Ahead of the low, wind at the surface and well overhead will increase and showers and thunderstorms will break out across eastern OK and TX into western AR and LA. The wind energy associated with this system will be the main ingredient that forces the development of a line of thunderstorms during the evening hours well to our west. As the low moves towards central MO during the evening, storms will break out along and ahead of the cold front and organize into a broken line that will stretch across central AR and down I-30 into northeast TX by about midnight. We expect this line to solidify and move through the metro in the early morning hours Thursday, or likely between 3-6am. As for impacts, the main threat with the line will be strong to damaging thunderstorm wind gusts of up to 55-70 mph along the squall line. With that much wind in place, both at the surface and above the region, an isolated tornado also cannot be ruled out, but the threat is minimal and seems to be focused over central AR. However, the vast majority of the wind energy will be of the straight-line variety. Storm Prediction Center severe weather outlook for Wednesday night. Click for larger image. Outside of the severe weather threat, the Mid-South will also encounter a rapid and significant change in conditions behind the front on Thursday. While temperatures will approach 70 on Wednesday with gusty southerly wind, Thursday will see daytime highs in the lower 50s occur around dawn, with temperatures falling into the lower 40s by mid-afternoon. In addition, west to northwest wind gusting as high as 30-40+ mph Thursday will produce a bad hair day, as well as make temps in the 40s feel downright brutal after upper 60s on Wednesday. Plan ahead for how you will get severe weather information if power is disrupted or you are asleep. Multiple ways to receive warnings is important, but you also need a way that will still work if the power goes out. The MemphisWeather.net mobile app will give you the latest radar information, forecast, and current conditions, as well as access to our real-time storm nowcasting via links to MWN on Facebook and Twitter (links also below). Add StormWatch+ to your app for severe weather notifications, including optional "wake-me-up" audio alerts in case of severe thunderstorms while you are asleep. 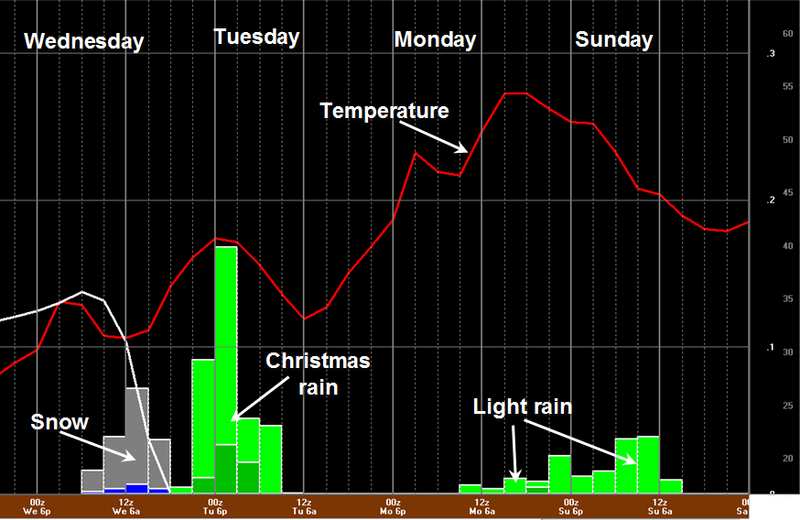 In the longer term (Christmas time), models are hinting at another strong system for the middle of next week. While there is plenty of time to determine exact impacts to the Mid-South, don't be surprised to see a wet forecast with the potential for thunder around Christmas. We'll monitor and keep you updated. A quarter-century ago, I had been living in the Memphis area for just over a year and was in middle school when an event occurred that I now believe was the first spark that started the fire, igniting a passion that lives in me to this day and likely determined my future career path. 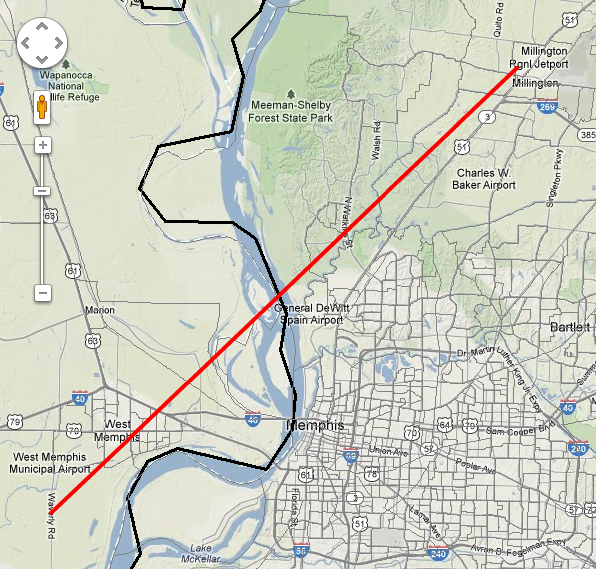 On Monday, December 14, 1987, at 9:40pm, a major twister touched down just southwest of West Memphis, AR and moved rapidly northeast at 60 mph, tearing a path through the city across the Mississippi River from it's namesake, then blew across the Mighty Mississippi (thus disproving the myth that the river and bluffs protect Memphis and Shelby County) and into Meeman-Shelby Forest State Park in northwest Shelby County before lifting just west of Millington, TN. By the time it was done, F-3 damage was recorded in both Arkansas and Tennessee along a 25-mile path, six people were dead, and 121 others were injured. Damage estimates were approximately $35 million, including 235 homes, 35 businesses (many along Broadway street in downtown), and a school in West Memphis and 88 homes in the Northaven development west of Millington that were destroyed or heavily damaged. In all, 1,500 people, or roughly 5% of the population of West Memphis, were left homeless. According to Associated Press archives, Arkansas Governor Bill Clinton sent in the National Guard and additional state troopers to put a halt to looting in the central business district following the tornado. The tornado also struck several high voltage power lines, including two 500,000 volt lines and three 161,000 volt lines, leaving much of Crittenden County, AR without electric power. Those killed included a woman in her mobile home, an elderly man in a boarding house, a teenager in a grocery store parking lot, a one-year-old child in an apartment building, a person in a vehicle that was thrown on I-40, and a person in a truck stop parking lot. As bad as it was, the destruction could have been much worse. At the time of the tornado, 7000 spectators were at Southland Greyhound Park dog-racing track in West Memphis, which the twister missed by just one-quarter mile. Video below is courtesy KATV meteorologist Todd Yakoubian (@KATV_Weather on Twitter). From a meteorological perspective, the tornado appeared to form just behind a warm front that lifted through the area. From observations taken at Memphis International Airport (the closest recording station to the tornado), it was 50 degrees at 7pm with wind from the east at 6 mph and dense fog being reported. An hour later, the temperature had climbed to 66 degrees (after dark) and wind shifted to the southeast at 21 mph with fog lifting. Between 9:00-10:15pm, the temperature was 70 degrees and wind gusted from the southwest at up to 40 mph as pressure bottomed out at 29.38". Surface map valid at 9pm with the surface low moving by just west of West Memphis. The map indicates that it was 70 at Memphis Int'l and 40 in Jonesboro, AR with heavy snow falling in the Ozarks. By 7am the next morning, the temperature had fallen back to 32 degrees following a night of westerly wind that gusted between 35-48 mph. Weather maps show a potent upper-level disturbance moving by just west of the area and a rapidly-strengthening surface low moving through AR that evening. Daily weather map for the morning of December 14, 1987. Low pressure over south TX lifted rapidly north and strengthened, reaching Chicago the next morning. The track of the low through AR put the Mid-South in prime position for wintertime severe weather. 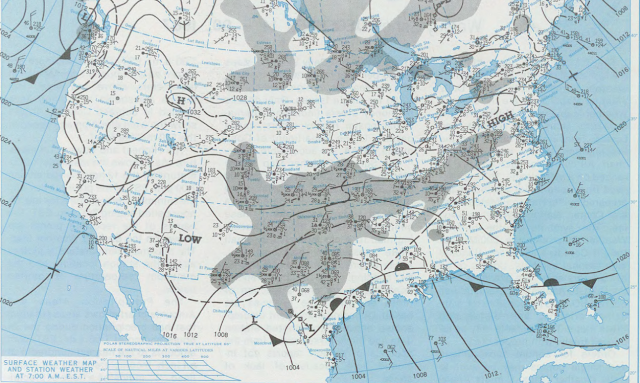 Upper level weather maps from December 14, 1987 at 6pm. Upper left: a strong jet stream over the Mid-South. Upper-right: an upper-level disturbance moving by to the west. 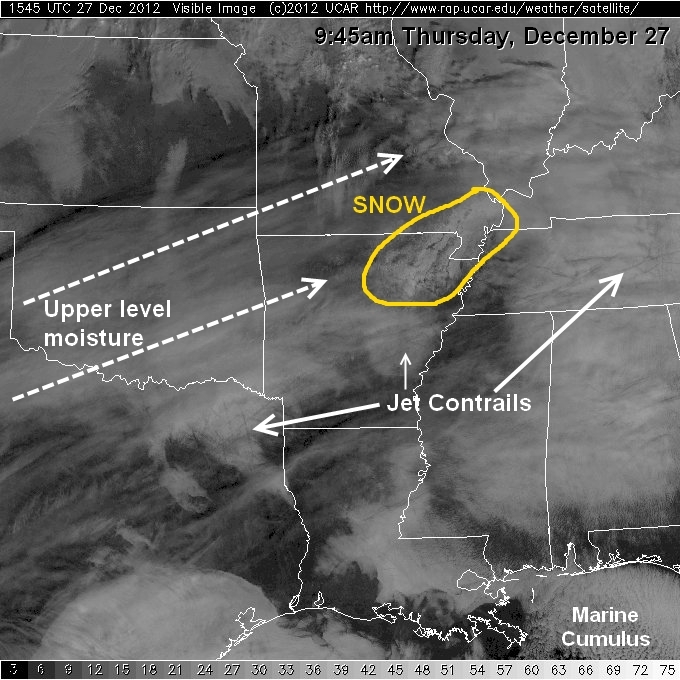 Lower-left: low pressure at 5,000' over southern MO. Lower-right: surface low pressure over AR moving rapidly north, placing the Mid-South in the storm's "warm sector." Unfortunately, the tornado was just the first event in a series of cases of bad luck dealt by Mother Nature. The town had not recovered from the tornado when parts of it flooded from 12" of rain eleven days later, on Christmas Eve night, leaving 1000 homes flooded and another person dead. Then, 7-10" of snow fell on January 6, another 11 days after the flooding rains. As snow melted, it added to the already existing misery caused by the flood and the destruction caused by the tornado. Oddly enough, West Memphis became the first U.S. city to be declared a federal disaster area twice in a two-week period due to this string of events. Many times, when a meteorologist is asked what triggered their interest in weather, it is a singular event that had an impact on their life. For many years, I was unsure of what that event in my life was. However, I knew that my passion began in the middle school years, shortly after I relocated with my family to the Memphis area. There is no doubt now though, as I now vividly recall the destruction of the city upon driving through it with my parents within a few days of the tornado, that the West Memphis tornado of 1987 was THAT event in my life. I find it hard to believe that it was 25 years ago! Perhaps that is also why I am so passionate about making sure people are informed and taking precautions when severe weather strikes, which has resulted in the services offered by MemphisWeather.net and our mobile app-based weather alert system - StormWatch+. Do you have more than a passing interest in weather, even if you're not in the profession? What event triggered your interest? If you've lived in the Mid-South for a quarter century, what do you recall about this event? I'd love to see your comments below! Severe weather threat continues for the entire metro though in a slightly diminished state. Strong wind gusts and hail are possible within and east of the watch box, including the entire metro. The NWS indicates that a watch box is not likely to be issued for areas east of the current area (see below for counties under Tornado Watch 677), though storm warnings are still possible in cells that exhibit strong to severe characteristics. We expect to see the line approach the western portion of the metro (Crittenden, northwest Tipton Co) around 8:30pm and progress slowly east, exiting the eastern side of the metro (Marshall Co) around 11pm. Finally, based on the latest forecast model data, a slight chance of sleet will be introduced into the morning forecast as precipitation tapers off and very cold air filters into the lowest few thousand feet of the atmosphere. Any wintry precip would be A) brief, B) light, and C) NOT stick due to ground temps that will still be very warm. MWN will continue to monitor and advise you of any changes on our social channels - Facebook and Twitter - where we have been in live nowcasting mode much of the day. A Tornado Watch was issued a bit ago for most of central and northeast AR, far northwest TN, and areas to the north until 9pm. In the metro, only Crittenden Co is included. There is a chance that the watch could be extended further east into west TN and northwest MS later on, or another watch for those areas could be issued. The probability of a tornado still remains low, but is higher in the current tornado watch than it is for areas east of the Mississippi River. We'll continue to monitor and advise you of any changes on our social channels - Facebook and Twitter. Not a lot has changed since yesterday's post regarding our chances of severe weather tonight. I encourage you to read that, as even the timing has remain virtually unchanged. The latest outlook from the Storm Prediction Center [SPC] (below) has the Mid-South placed in a Slight Risk area for the possibility of storms containing damaging straight-line wind, hail, and a low threat of tornadoes. A Slight Risk zone encompasses the Mid-South due to the possibility of damaging wind, hail, or an isolated tornado during the evening hours today. Scattered thunderstorms will break out across AR this afternoon, which has prompted SPC to begin considering a Tornado Watch. These storms will pose the best threat for a tornado, and even that is not particularly high. A few of these storms could push into the metro early this evening prior to the organization of a squall line of storms in AR. That line will move east just ahead of the cold front and likely affect the metro between 8-11pm. The squall line will bring our best chance of severe weather - in the form of straight line wind and hail. After the line passes, rain will be likely overnight until mid-morning Monday and temperatures will plummet as Arctic air overruns the region. Look for temperatures in the lower 40s (perhaps upper 30s just to our north) all day Monday. In fact, if temperatures aloft cool enough while it is still raining, we cannot completely rule out a few sleet pellets mixed with the rain Monday morning. Ground temperatures will still be warm and nothing would stick. Rain ends by lunchtime and temps remain some 25-30 degrees colder than today. Now is a good time to make sure you have multiple ways of getting severe weather warnings, especially if you happen to be asleep. Weather radios are a great tool, as are TV and commercial radio broadcasts. However, you should also strongly consider a smartphone app for receipt of severe weather information. We put a great deal of effort into our MemphisWeather.net mobile app with StormWatch+ severe weather notification. StormWatch+ is designed to warn you ONLY IF YOU are in the path of the storm, and it will wake you up for the most dangerous storms. 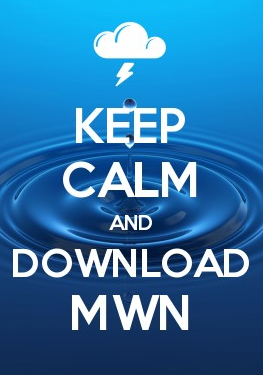 Peace of mind is only a download away! In addition, we will be bringing you the latest information as storms develop and move through with our social media nowcast service via Facebook and Twitter. Check us out! Last, the NWS relies on eyes and ears on the ground to know whether storms are producing severe weather. If you are on Twitter, you can relay severe weather reports to the NWS by using #mSpotter. Reporting can even be done through our MWN mobile apps! Learn more about #mSpotter (what types of weather they need and how to report ) by clicking here. Yesterday, we wrote about the potential for thunderstorms this weekend and infiltration of Arctic air into our unseasonably warm early December weather pattern. The thunderstorm pattern has been born out this morning as rumbles of thunder and scattered heavy rain showers have popped up throughout the metro. For the rest of the day, expect a general "lull" in activity this afternoon with another round arriving this evening into the overnight hours. If you have outdoor plans this afternoon, plan on temps in the 60s and hit-and-miss light showers - a waterproof jacket would be appropriate. We'll continue to bring you the most up-to-date weather info through our social media nowcasting on Facebook and Twitter. 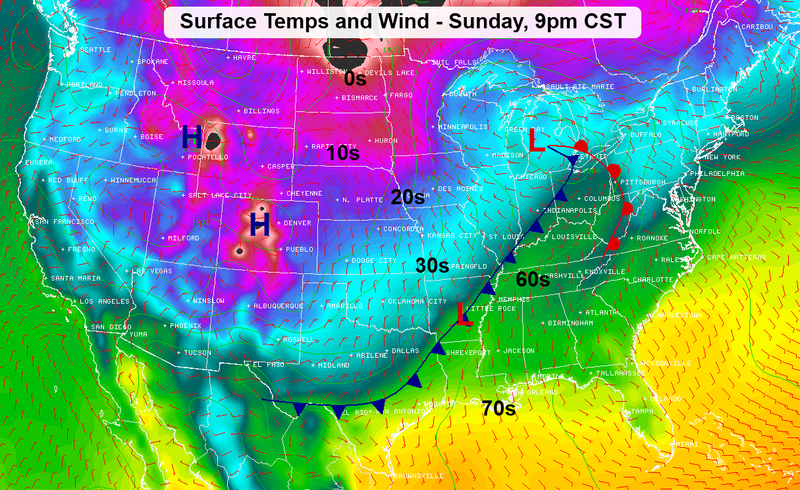 On Sunday, a well-advertised cold front will march into the Mid-South. The difference between the airmass ahead (very warm & moisture-laden) and behind it (much colder) will cause the formation of thunderstorms along the front. With strong wind blowing over the top of and into the system, some thunderstorms could be strong to severe. Currently, the Storm Prediction Center has the metro included in a Slight Risk of severe weather for Sunday evening into the early overnight hours (see graphic below). Southeast AR, northwest MS, and far southwest TN are included in a Slight Risk of severe storms late Sunday afternoon through Sunday evening. Damaging straight-line wind & large hail are the main threats. While scattered t'storms are possible ahead of the front from Sunday afternoon into the evening, a squall line of storms is expected to form along or just ahead of the front itself, bringing a threat of damaging straight-line wind and a chance of large hail. The tornado threat is very low for this system. 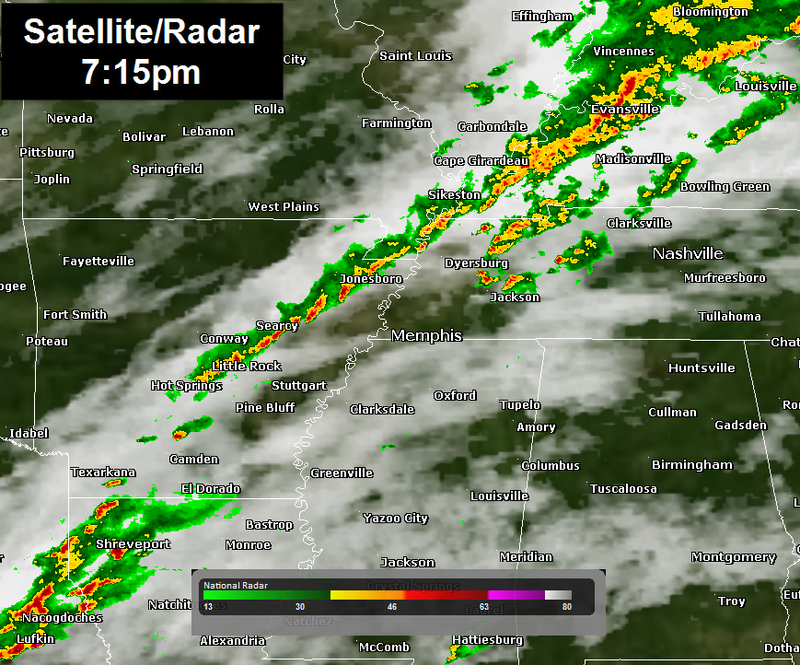 The line will likely move through in the late evening hours, or sometime between 8pm and midnight. Behind the line, we'll see widespread rainfall that will last into the morning hours on Monday, as well as rapidly falling temperatures. In fact, temps will stay in the 40s all day Monday - or some 25-30 degrees colder than Sunday! Severe weather is certainly possible in early December, as we are still in the tail end of our secondary severe weather season (recall the West Memphis tornado of December 14, 1987 and the Germantown tornado of November 27, 1994). Now is a good time to make sure you have multiple ways of getting severe weather warnings, especially if you are asleep. Weather radios are a great tool. The other, more customizable, way is via smartphone apps that will wake you up, but only if the storm will affect your precise location. 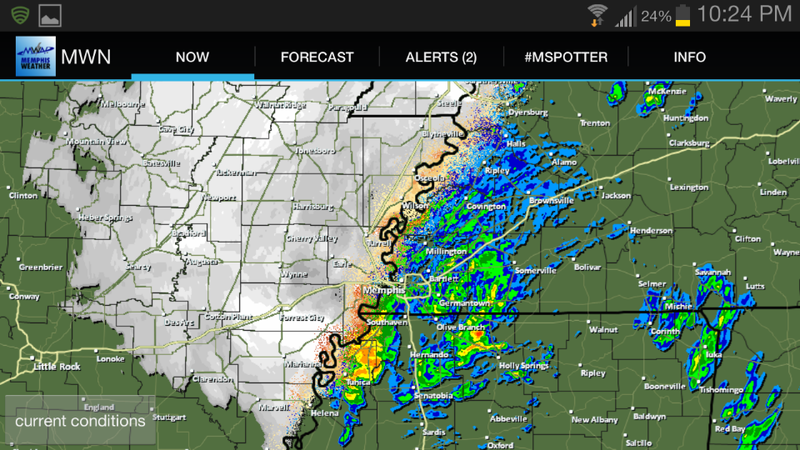 Check out our MemphisWeather.net mobile app with StormWatch+ severe weather notification. It was designed with the requirements above in mind. Plus it's a great way to "shop local" AND stay informed and safe! This time last week, we were talking about an unusually warm December weekend and the potential for thunderstorms early in the work week. It's deja vu all over again! While one very warm weekend in December is not unusual, two in a row is somewhat rare. However, the way this weekend is ending we'll not see the 70s again for some time. A blast of winter is moving in! Before we get to winter, let's talk about the lead-up to the main event, which is the chance of thunderstorms over the next couple of days. A cold front will move into the Mid-South on Saturday, setting up very close to I-40 from Little Rock to Memphis to Nashville by Saturday afternoon. Though we'll stay on the "warm side" of the front, any minor disturbances that move along it will combine with temperatures near 70 and plenty of moisture from the Gulf to set off scattered showers and thundershowers. While there will be a slight chance of showers again Saturday morning (as we had the past couple of mornings), it appears that the chance goes up a little in the afternoon (to about 40%) and a few showers could generate some lightning and rumbles of thunder, though no severe weather is expected. Overall, any thunder should be widely scattered and, unfortunately, not something we can pinpoint 24 hours out. Outdoor events, such as local Christmas parades planned for the afternoon, will need to be monitored closely. Rain chances appear to increase further after dark Saturday with a good chance of showers and a few thunderstorms near and ahead of the front. A cold front will reside just to our north Saturday evening, bringing a chance of rain and a few t'storms. Late Saturday night, the front will begin to retreat back to the north as low pressure forms along it to our southwest. Rain chances decrease substantially by Sunday morning as the Mid-South will once again be firmly in the warm sector of the next weather system. The focus then shifts to the low pressure system to our west and the re-emergence of Saturday's front, as it gets a significant "shove" from a Canadian cold front that will be escorting MUCH colder air into the region. As the low travels along the approaching front, it will bring increasing atmospheric dynamics, particularly wind aloft, and will be pushed along by a strong jet stream. As the low and cold front approach the region late Sunday, we expect more thunderstorms to break out from east Texas into the Mid-South. Due to the amount of wind energy associated with this system and the large temperature contrast along the front, there is a small chance that a few thunderstorms could be strong to borderline severe Sunday evening into the early overnight hours just ahead of and along the front. The timing is still somewhat uncertain, but it appears the best chance for any strong storms will be from around dusk (5pm) until midnight. Damaging straight-line wind would seem to the be the biggest threat, besides lightning. 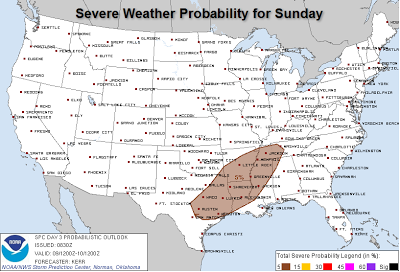 The Storm Prediction Center has placed our area under a small probability of severe weather Sunday (see graphic below). 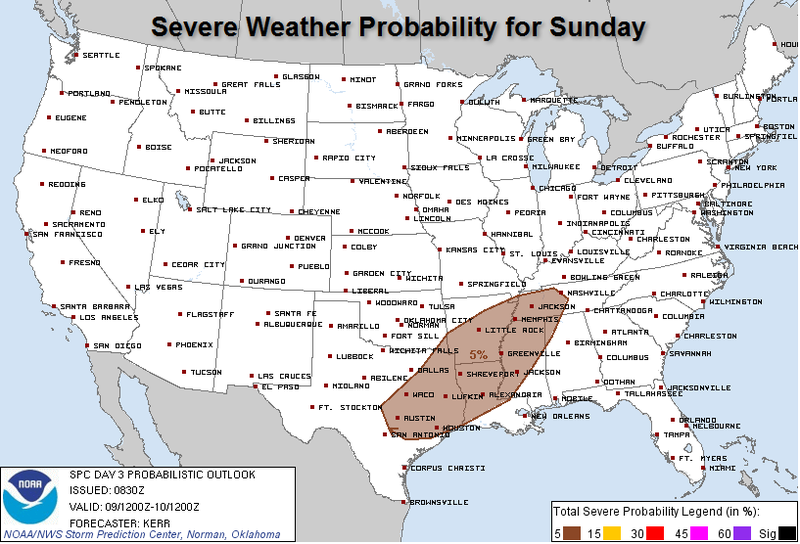 Area with an elevated risk of seeing severe weather Sunday. The risk is not high at this time and damaging wind will be the main threat. In addition, rain could be heavy at times with this system, and it will continue behind the front into the morning on Monday as more waves form along the front while it slowly sinks south. Plan on a wet start to your work week and likely rain-induced delays in your commute. The heaviest and steadiest rain will fall overnight Sunday night into early Monday. The graphic below shows the potential for up to 2" of rain in the metro this weekend into Monday. Expected precipitation amounts approach 2" in the metro with the next weather system. The other big story with this front will be the return of WINTER. Temperatures will fall quickly from the 60s Sunday evening into the 40s by Monday morning. Very little if any recovery in the temperatures is expected Monday, depending on how long the rain sticks around. With showers and clouds over the area and a brisk north wind, temps will hold in the 40s all day Monday and wind chills will likely be in the 30s. Quite a difference from a projected high in the lower 70s Sunday! The map below shows the sharp temperature contrast behind the front. Note that very cold air originates in Canada and extends across most of the western U.S. behind the front. This will mean a prolonged period of much cooler weather as we go through next week. Canadian high pressure behind the front will mean a significant drop in temperatures as we start next week. MemphisWeather.net will keep you updated throughout the weekend on expected and current weather conditions. Follow us on Facebook and Twitter (links below) for the latest information and download our mobile app on Android or iPhone for the most recent forecast and detailed radar information from StormView Radar. Following a year of average monthly temperatures that were above normal, Memphis International Airport finished the month with below normal temperatures for the second month in a row, due mainly to low temperatures that averaged more than 3 degrees below normal. Rainfall was well below normal once again continuing a dry 2012. There was one severe weather event, on November 3 (when the temperature soared to a record high of 83 ahead of a cold front), which prompted Severe Thunderstorms Warnings in the metro area. Quarter to golf ball sized hail was reported in Shelby County. Through November 30, the average temperature for 2012 of 67.5 degrees is 2.8 degrees above normal, making 2012 (still) the warmest year on record though the end of November, but only by 0.3 degrees (2007, 67.2 degrees). Drought conditions abated slightly, even though rainfall was well below normal, and precipitation for the year is still nearly 15" below average. Most of the Memphis metro is now classified as being in a moderate drought, a significant improvement from "extreme" at the beginning of September. The average temperature for the month of November was 51.7 degrees, or 1.5 degrees below normal. The average high temperature was 62.9 degrees and the average low was 40.5. The coolest temperature of the month was 30 degrees on the 28th, while the highest temperature was 83 degrees on the 3rd, which also set a record high for the date. There were 3 days in which the low temperature fell to freezing or below. Precipitation for the month totaled 2.90", which was 2.59" below average. There were 7 calendar days with measurable rainfall, only 2 of which saw totals of 0.50" or more (maximum 1.23" on the 11th, which set a daily precipitation record). The peak wind gust was 39 mph from the northwest on the 3rd with an average wind speed for the month of 5.8 mph. Click here for a daily statistical recap for Memphis International Airport. The average November temperature at Cirrus Weather Solutions was 48.1 degrees with a maximum of 83.5 degrees on the 3rd and a minimum of 24.1 degrees on the 28th. November precipitation measured 2.41" via the Cirrus automated gauge and 2.48" in a manual gauge used for the CoCoRaHS program. The measured peak wind gust was 21 mph on the 11th. Average relative humidity was a muggy 74%. Click here for a daily recap on MemphisWeather.net. For the month of November, the average temperature error in all MWN temperature forecasts was 2.14 degrees, lower than all available full-range computer model data and the National Weather Service. More than 61% of the MWN temperature forecasts for the month were within 2 degrees of the actual temperature. MWN's forecasts extend out five periods (2.5 days, or roughly 60 hours). For dewpoint accuracy, the MWN forecast averaged 2.70 degrees of error and fell within 2 degrees of the actual dewpoint over 57 % of the time. Historical accuracy statistics can be found here. Download our iPhone or Android apps, featuring a fresh new interface and StormWatch+! As first reported by AccuWeather, just 5 days after the end of the 2012 Atlantic hurricane season and a little over a month after "Post-Tropical Cyclone" (aka, Hurricane) Sandy washed ashore in New Jersey with nary a Hurricane Warning to be found, the National Hurricane Center has re-defined the warning that should have been issued. This move, while not totally unexpected and certainly in the best interest of their vast customer base, was perhaps unprecedented in terms of how quickly it was made. Typically, changes to National Weather Service products, watches, and warnings go through a lengthy trial process with suitable time for customer and user feedback, before the final decision is made to make the change. It was a shame that the amazing track and intensity forecast provided by the Hurricane Center forecasters had to be overshadowed by the decision to leave warning the public to local NWS offices due to the straight-jacket they were put in by an inflexible process. It is possible, if not likely, that lives were lost as as result and apparently the Hurricane Center felt that Hurricane Warnings should have been issued for Sandy in their Monday morning quarterbacking sessions. However, I for one am glad to see this swift and decisive change that will enable the Hurricane Center to more accurately inform those in the path of the next "post-tropical cyclone." Well, there goes the "swiftness" of the decision to change the definition of a Hurricane Warning. A proposal was raised during the NOAA Hurricane Conference last week for NWS to have the option to issue hurricane and tropical storm watches and warnings for post-tropical cyclones that threaten life and property. This is one step in the process required before any proposed change to operational products becomes final. As part of our review of the 2012 hurricane season, including the Sandy service assessment, we will review all policies and changes through the existing and established process. Special thanks to Nate Johnson (@nsj on Twitter) who provided the updated information. Download our iPhone or Android apps, featuring new interfaces and StormWatch+! The last week in November has featured a warming trend that is peaking on this first weekend in December. Though winter doesn't officially begin until December 21, "meteorological winter" (defined by the weather community as December-February) is starting off on a beautiful note with highs reaching 70+ for the next few days! The cause for the unseasonably warm temperatures can be identified in today's surface and upper level weather maps. A stationary front is positioned well north of the region, stretching from the NYC area west across the Great Lakes towards low pressure over the Plains. A large ridge of warm high pressure dominates the weather south of that boundary, meaning above normal temperatures can be found throughout the Mid-Atlantic, Southeast, and Southern Plains. Looking up to about 18,000' (or what meteorologists refer to as the 500mb layer, shown below), we see a pattern of "zonal flow" across the nation, which means wind is blowing pretty much west to east. The 500mb chart below shows that the lines (isobars) in brown are fairly straight from west to east with just subtle peaks and valleys. Wind blows parallel to the isobars, and a zonal pattern means little temperature change and no major storm systems. The wind at this level is generally the one we watch to see the eventual path of any mid to upper-level storm systems. 500mb (18,000') level of the atmosphere. Zonal (west-to-east) flow indicates no major storm systems are in play across the continental U.S. In the map below, we are looking up even higher in the sky, about 34,000' (or 250mb) or where the jet stream lives. We also see a fairly zonal flow here with no major ripples in the isobars, other than a moderate trough, or valley, off the U.S. east coast. In addition, the blue colors, which represent stronger wind and the location of the jet stream, is well to our north, roughly along the U.S./Canadian border. The jet stream separates warmer continental air from colder Arctic air, so that cold air is being bottled up over Canada. 250mb (34,000') level of the atmosphere valid late Saturday. Zonal flow exists with the jet stream (blue colors) positioned along the U.S./Canadian border, pinning cold air north of the CONUS. Though the west coast of the U.S. has been pounded by a series of Pacific low pressure systems, the position of the jet stream well to our north will mean the brunt of these systems, as they move across the country, stays to our north, which is important as we look ahead to early next week. One of these Pacific-origin systems will force the jet stream to begin to take a dip across the middle portion of the country by early in the week. This will allow a cold front to move into the region on Tuesday, bringing high chances of rain and possibly a few thunderstorms. This "dip" in the jet stream is reflected in the map below, valid late in the day Tuesday. 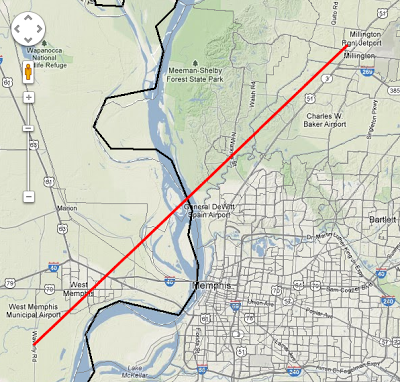 You can see the valley that is formed by the black lines that extends roughly down the Mississippi River Valley. Jet stream map (250mb) valid late Tuesday shows a pronounced trough (or valley) of low pressure over the middle of the country, trailing a cold front moving across the nation's mid-section. The positive side of the front that moves through on Tuesday, besides some much needed rain, is that since it originated over the Pacific and not in Canada, the air behind it is not all that cold. So while we expect a cool down for mid-week, highs will likely still reach the 60s, which is well above normal for this time of year (normal high is in the mid 50s). We'll continue to monitor the front that arrives Tuesday and bring you any updates on rain and thunder chances. For now, severe weather chances look slim to non-existent as the front moves through. Click here for the complete MWN Forecast. Download our iPhone or Android apps, featuring updated interfaces and StormWatch+!